Cutworms are plump, soft-bodied, dull grayish or brownish caterpillars, 1 to 2 inches long, and usually found in a curled position. The adult is a moth. As nocturnal feeders, cutworms inflict damage quietly and invisibly. They generally attack seedlings overnight, severing stems at or just below soil level. (Please note: an angled cut may indicate rabbits are the culprits.) Additionally, cutworms will sometimes attack entire root systems, causing plants to wilt and collapse. Unfortunately, once cutworms do their dirty work, it is irreversible. If this pest is an annual problem in your yard and garden, you'll need to use barriers to deny it access to its favorite plants, which could include just about any transplant or seedling! Experience will tell you which ones are particularly vulnerable in your garden. The best control strategy is to protect individual seedlings with a 3 inch collar made from stiff paper or plastic; sections of paper towel rolls or toilet paper rolls are ideal. Push the collar an inch or so into the ground. You can also try planting vulnerable crops in half-gallon paper milk cartons. When you transplant them outside, just cut out the bottom of the carton and plant the whole unit, leaving the top rim of the carton sticking out of the soil about an inch. Alternately, make a trap by sprinkling 1/2 teaspoon of cornmeal or bran meal around each plant. 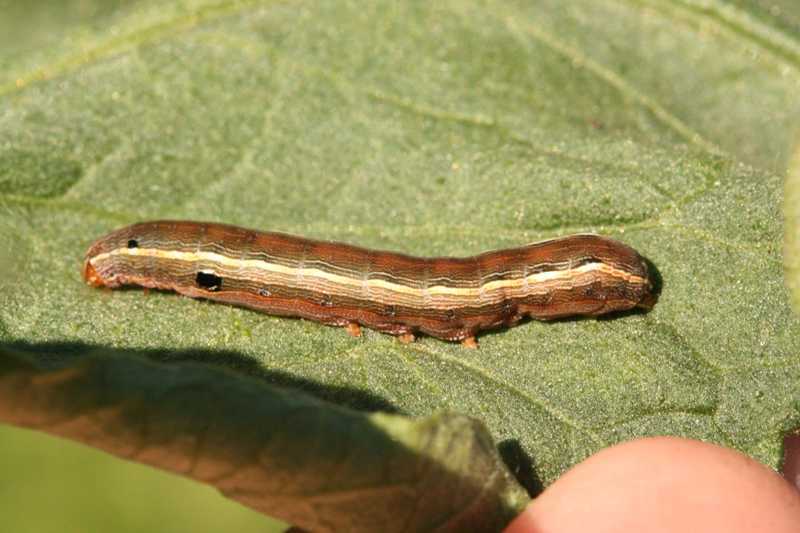 Apply it in a circle leading away from the stem of the plant; the cutworm will eat the meal and die. Or, sprinkle diatomaceous earth or wood ashes around plants. Juvenile nematodes are also an excellent control. 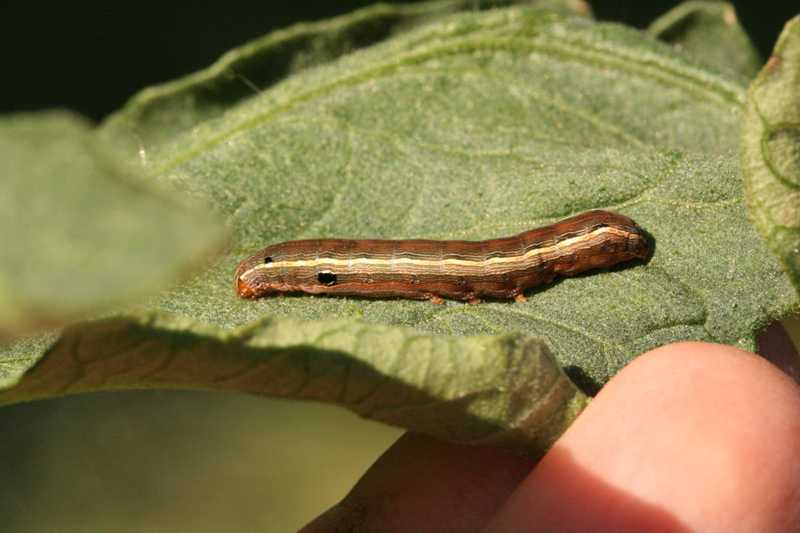 To help prevent cutworm problems next season, remove all old plants and overgrown weeds as soon as you finish the harvest for each crop in the fall, then cultivate the soil thoroughly to a depth of 6 to 8 inches. 2 to 3 weeks later, give the garden a shallow cultivation to about 2 inches, thus exposing cutworm larvae to hungry birds. In the spring, give the garden another shallow cultivation about 2 weeks before planting. In addition, clearing the rest of the yard of weeds and mowing the lawn closely in the fall will keep the cutworm population in check.